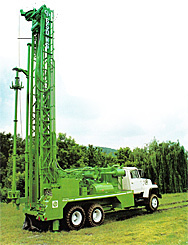 Chambers Drilling offers well drilling, pump system installation, pump repair, chlorination and well clean-out. Free estimates, research of surrounding wells and on-site consultations! Water Well Contractors License # 362. Registered Montana Contractor #11428. Bonded & Insured. A Well Adds Value to Your Property! CALL US FIRST! All too often people find a beautiful piece of land and buy it without checking water resources in the area. Just because the land is in a great location and looks beautiful does not mean that there is ground water available! Give us a call and let us do some research for you. We can investigate well logs in the surrounding area and inform you of well depths and water yields present in that vicinity. This is a free service to our potential clients.